In Words Drown I presents: a carnivalistic exhibition experience. The early carnival was a site of disorder and survival, deeply connected to the bodily experience. It embraced ritual spectacles such as feasts, competitions, comic shows, dancing and open-air amusement with costumes and masks, giants, monsters, trained animals–in short all the ‘low’ and ‘dirty’ kinds of folklore tradition. On the positive side the early carnival explored collectivity, on the negative side it perpetuated class hierarchy, political manipulation, sexual repression and paranoia, as well as contributed to a misinformed public. 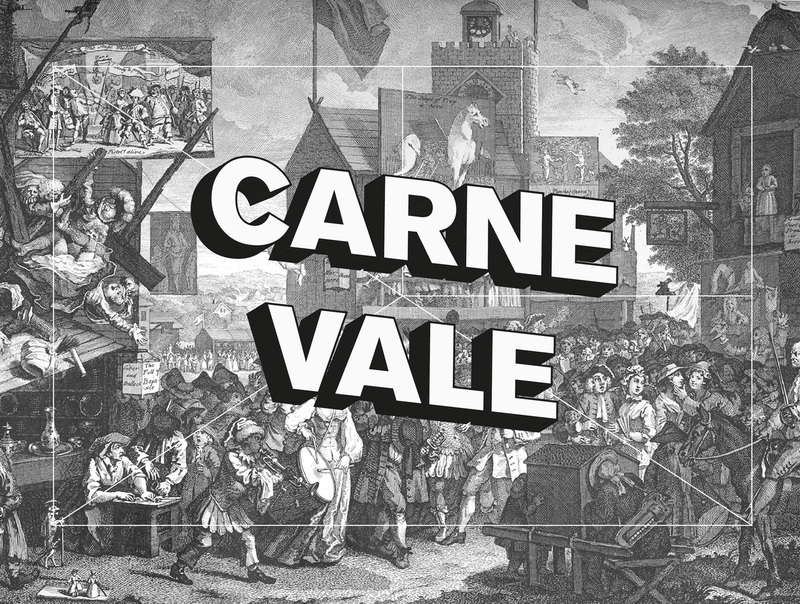 CARNE VALE is an experiment and an exhibition experience that investigates the cultural, social, ethical and political implications of the early carnival through daily performances and film screenings. It is developed around the essay, “No Man is an Island, Entire of Itself” by the exhibition’s curator Mille Højerslev Nielsen, which addresses the spectacle of early carnivals. Participating artists include Ella Joyce Buckley (US), Mikkel Carl (DK), Steven Day (US), Gerard Faroux (FR), Ingen Frygt (DK), Rebecca Goyette (US), Madeleine Kate (DK), Mathias Kryger (DK), Dominika Ksel (PL), Piero Passacantando (IT), Laurent Pernel (FR), Risa Puno (US), SCRIMPY (US), Jessica Stoller (US), Peter Voss-Knude (DK), Alexandria Wailes (US), and former and current Flux Artists-in-Residence Constantin Hartenstein (DE), Anne Duk Hee Jordan (DE), Christine Laquet (FR), Anastasios Logothesis (GR/SE), Stéphane Pauvret (FR), Theodoros Zafeiropoulos (GR). In Words Drown I is a curatorial and aesthetic platform from where exhibitions, events and publications are produced. In Words Drown I is interdisciplinary and multidisciplinary in its approach and the goal is to break down common ideas about contemporary literature and visual art.